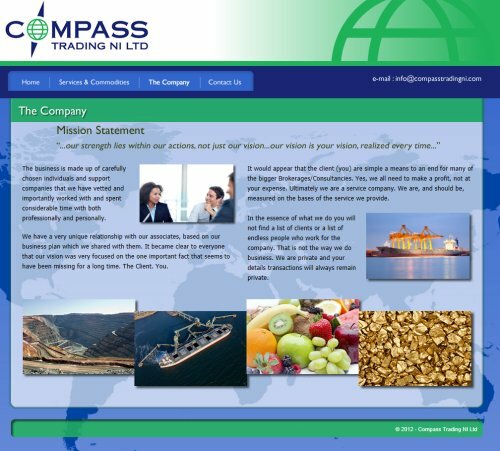 Compass Trading NI Ltd is a boutique consultancy and commodities brokerage based in Northern Ireland working with clients who require physical commodities including fruit, coal, fuel, sugar, cotton, etc. The business has representatives throughout the world including Colombia, South Africa, Democratic Republic of Congo, Zambia, Zimbabwe, Botswana and Mozambique, home of some of the world’s most sought after commodities. Ardnet’s brief in this project was to produce a new corporate identity including logos and company colour scheme, along with a new corporate and dynamic website. We designed a number of different drafts of logos along with colour schemes and worked closely with the client to choose the best solution. We then sourced imagery and produced a website in keeping with the dynamic and corporate feel of the business. The site includes animated slideshows that are fully compliant for display on smartphones as well as a live commodities price table.